Orion - ZineWiki - the history and culture of zines, independent media and the small press. Orion was a science fiction fanzine published in the 1950s in the UK. 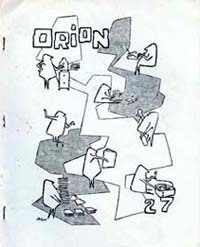 The first 20 issues of Orion were published by Paul Enever, from December 1953 till 1958. Contributors during this period of publishing included Walt Willis (Hyphen). He then gave over the editorship to Ella Parker, who continued to publish it under the same name for several more years. In her first year of editorship she entered the Skyrack Readers Fan Poll as the third favourite fanzine in Britain. Contributors during this time included Sid Birchby, who wrote a regular column, Keith Elliot, Paul Enever, Rory Faulkner (Shangri L'Affaires), Don Ford, Neville Goldberg, Jim Groves (Vector), Sandra Hall, Dorothy Hartwell (Trial), Fred Hunter, Terry Jeeves (ERG), Jim Linwood (Typo), George Locke (Smoke), Archie Mercer (Vector), Len Moffatt (The Outlander), Jim Norrie, Joe Patrizio (Ipso Facto), Alan Rispin, Harry Warner, Jr. (Horizons), and Bobby Wild (Vagary). As well, John Berry (Pot Pourri) contributed on-going "Sergeant" stories, Ken Bulmer (Science Fantasy News) published regular installments of his "TAFF Tales" (TransAtlantic Fan Fund Tales), and Andy Young supplied installments of his accounts in Europe, called "European Pumble". Arthur Thomson regularly supplied the highly regarded covers and illustrations, as well as reviewing fanzines. Other artwork came from Dan Adkins, and Joe Patrizio. Orion won the Skyrack Readers Fan Poll for Best British Fanzine for the year 1960. In 1961, it came in second, beaten by another of Parker's publications, The ATom Anthology. Ella Parker ceased publication of Orion in 1962, after 29 issues had been published. The same year she again won the Skyrack Readers Fan Poll, this time for Fan Personality of the Year, and her report of her trip to the U.S.A., Parker's Peregrinations, was voted one of the Top Ten British Fan Publications. She continued publishing fanzines, releasing Compact for the Offtrails Magazine Publishers Association. This page was last modified on 15 September 2015, at 14:25.